Ruddock had the experience but he also brought continuity. One problem with passing through ex-pros on their way up is that they don’t want to stick around. They want a quick success, a pat on the back and a bigger job. Coaches like Lancaster were serious about player development. 5 years in Leeds academy and 4 coaching in the RFU before he was given the interim job. The main point I was trying to make (obviously unsuccessfully) is that coaching for a closed period Tournament is a very different challenge than season-long player and team development under a Head Coach. There's a very different dynamic in the limited timeframe and there's also a much bigger emotional element for players in and out of selection / form / contention etc. Bringing together what is effectively a closed group for a 6 / 7 week period requires lots of expertise and is not a skill learned well on the hoof. BTW, Carolan was much more successful in his 2nd year. 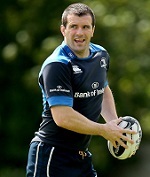 i'm not worried about the leinster players being developed while lancaster is here. El Diablo wrote: When do the IRB normally announce the nominations for World Junior Player of the Year? I thought it was usually straight after the u20 WC but I havent heard anything. Would N'tamack be one of the favourites I wonder? According to wikipedia no french player has even been nominated in all the year! I cant see Doris following in Max Deegan's footsteps as we finished 11th although he could be nominated. Its named already i think. He was named the "Breakthrough player of the tournament" whatever that means!! F**k me...he he is not 18 until July 31st and he is 110kgs according to Ultimate Rugby Is that natural? Yeah, just look at 17/18 year olds being recruited to college football in the states. Genetics. Africans and Polynesians reach physical maturity faster than whites. I remember a year or two ago France had another in the backrow who scored a spectacular try against us. It was like man against boys. Add to that the intense training the french players go through. It should be interesting to see how Joseph develops. Like everyone, i was disappointed how this tournament went. I thought we (probably correctly) threw everything at France and South Africa and it unravelled a bit when we got no reward. That said, one thing that I think has gone a bit under appreciated is the quality of the Georgian and (to a lesser extent) Japanese performances. Not just against us, but throughout the tournament. I was lucky to see a fair bit of them and they were genuinely fantastic. Look at their results: Georgia ran France and South Africa close. They deservedly beat us and Scotland. Japan lost to Wales by a just a point, were well beaten by New Zealand and Australia to be fair, but really had their pockets picked by that good Georgia team late on. They very nearly relegated us too. Now I know people will say: you’d need to be beating the likes of Georgia, but we are verging into arrogance here. I honestly watched them and thought to myself this looks like something is happening here. These boys will not be left on the outside looking in for much longer. And it wasn’t just what you would typically expect from Georgia. Ok their pack was massive, but they handled very comfortably. Their fly half was outstanding, their full back a beautifully balanced runner and their winger (11) was a rocket nearly bagging a quality hat trick v Scotland. They had class in the back line and are a quality outfit. For Japan, I’d be surprised if the 2 lads of Tongan heritage for Japan at 8 and 11 don’t play senior international rugby sooner rather than later. But just their teamwork as a unit was exceptional. Their breakdown work is so co-ordinated and they really don’t drop much ball, even when playing at high tempo. I was gutted to see them relegated! We clearly have a lot of learning to do and improvements to make after this year, and we will need to because these sides are improving substantially at this level. The bottom line questions to be asked. Could we have done better with better coaches and are they available. Oldschool wrote: The bottom line questions to be asked. You don't buy them, you make them. Fan with smartphone wrote: Like everyone, i was disappointed how this tournament went. I thought we (probably correctly) threw everything at France and South Africa and it unravelled a bit when we got no reward. That said, one thing that I think has gone a bit under appreciated is the quality of the Georgian and (to a lesser extent) Japanese performances. Not just against us, but throughout the tournament. I was lucky to see a fair bit of them and they were genuinely fantastic. Look at their results: Georgia ran France and South Africa close. They deservedly beat us and Scotland. Japan lost to Wales by a just a point, were well beaten by New Zealand and Australia to be fair, but really had their pockets picked by that good Georgia team late on. They very nearly relegated us too. Thats all true, but to a certain extent its not about whether we win games at this level, although thats important certainly, its about preparing elite age-grade players for professional rugby. We don't need the u20s to be winning tournaments, we need the team to develop as many guys as possible each year into players who can move into the professional ranks and to do that the team needs to be well coached and well organised. It doesn't matter if we're playing the Baby Blacks or Japan, as long as the team looks well prepared with a proper defensive structure in place, a well organised pack and some concept of how they are going to attack. Anyone who watched this years under-20s can't say that any of this was true, regardless of the opposition. That's what asking the right questions is all about. The next question is are we doing enough to make them? What are we doing to make them? England and France have National Academies because they can't rely on clubs on their own. But that also means that they can badge up their coaches and aim to make a longer investment. Dave Cahill wrote: its about preparing elite age-grade players for professional rugby. Surely that's the responsibility of provincial academies or does the U20 coaching staff have full time access to the players throughout the season? I agree about Georgia (although didn't see the full game against us) but not Japan. I thought they relied really heavily on those two players you mentioned and we played into their hands by kicking it to them and being really poor defensively, as well as just giving up ball to them really easily and not getting back into any kind of defensive shape which meant they just had to put the ball through the hands and then were in acres of space. Defensively Japan were terrible, I really think we made them look a lot better than they really were. Early on in that game I was thinking that Doris really deserved to be in the mix for player of the tournament but then had a sudden realisation that the standard of that particular game was absolutely awful. dropkick wrote: I remember a year or two ago France had another in the backrow who scored a spectacular try against us. It was like man against boys. The flanker who basically out-paced the whole Irish backline?